I'm still firmly on the Glow Recipe Watermelon Glow skincare train now that I've tried their latest Glow Recipe Watermelon Glow Jelly Sheet Mask. It's made with an oil free, jelly hydrogel and is also a transparent pink shade, (which allows your skin to show through the mask - making it barely noticeable you're wearing one!) So the Glow Recipe Watermelon Glow Jelly Sheet Mask is perfect for using on a long haul flight or even a car ride and not getting funny looks by people around you. 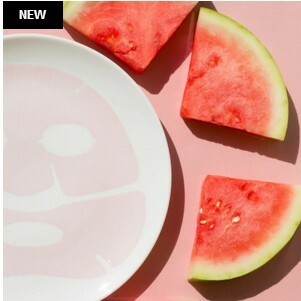 The Glow Recipe Watermelon Glow Jelly Sheet Mask comes in two pieces *(shown below) to allow you to customize the mask to your face for the perfect fit. The hydrogel molds effortlessly to skin, making it slip off proof whether you are laying down or busy around the house. I loved the feel of the mask and that wonderful watermelon scent which carries through their line of products (but it's much lighter than their sleeping mask and moisturizer). Note: There's now a Glow Recipe Watermelon Set which is perfect for trying the other two products in the line which I use religiously - the sleeping mask and the Glow Recipe Watermelon moisturizer. For those of you who haven't use any of the Glow Recipe Watermelon products, this watermelon scent is fresh and authentic (forget about any sugary or fake watermelon candy fragrance). I was able to either relax or go about my activities at home while getting hydration and a cooling (not overly cold!) soothing sensation. 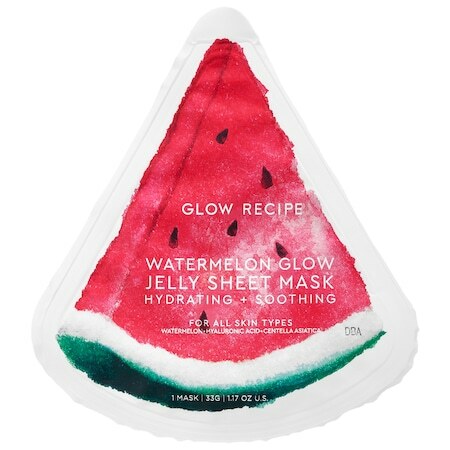 Glow Recipe Watermelon Glow Jelly Sheet Mask is light and refreshing for summer, and the perfect way to hydrate and balance skin that's on the oily/combination side, like their other Glow Recipe products. I used the Glow Recipe Watermelon Glow Jelly Sheet Mask twice a week, many times in the morning as pre-makeup prep and to de-puff my skin. I left the Glow Recipe Watermelon Glow Jelly Sheet Mask on for 15-20 min and the essence inside of the mask absorbed nicely into my skin without feeling gummy or sticky. After removing it, my skin glowed and was soft and hydrated, but not oily or greasy. Note: Immediately after removing the mask, my skin did feel slightly sticky, but once I patted the remaining essence in, it felt smooth and looked glowy.